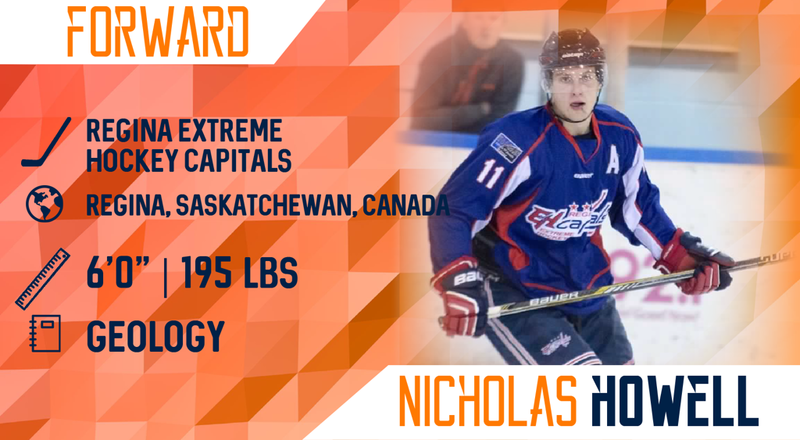 Join us in welcoming the newest addition to the Miners Hockey Club roster, freshman Nicholas Howell from Regina, Saskatchewan, Canada. I chose UTEP because it has such a unique landscape and warm climate and it's an excellent place to study geology in the field. I am looking forward to playing hockey at a college level in a new country. As well as meeting new friends while playing the sport I love. My favorite moment was competing at the Canadian championships for Jr. Hockey and making it to the bronze medal game. I started playing hockey when I was 3 years old. My favorite activity outside of hockey would be working out and being outdoors.